This paper by Sivan Tuchman and Patrick J. Wolf examines the impact of enrollment in a private school choice program on students' special education identification and de-identification. 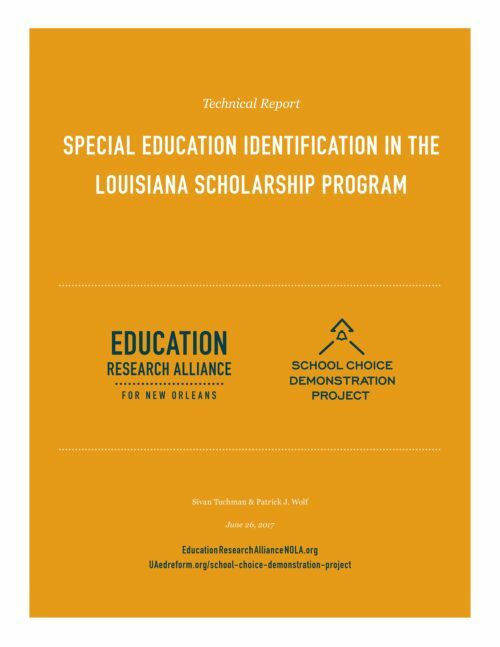 Using data from almost 2,000 students who were randomly assigned to private schools in the Louisiana Scholarship Program (LSP), this study finds no statistically significant impact of enrollment in the student’s first choice school on being either identified or de-identified in special education. Analyzing annual trends results in lower probabilities of identification for students in the LSP during year 2 and year 3 of the program and higher probabilities of de-identification in year 2. This report is summarized in the policy brief How Has the Louisiana Scholarship Program Affected Students? A Comprehensive Summary of Effects After Three Years by Jonathan N. Mills and Patrick J. Wolf.